Quite simply, Intangible Drilling Costs (IDCs) represent all expenses an operator may incur at the wellsite that don’t – by themselves – produce a physical asset for the producer. In the oil and natural gas business, those costs include things like labor and site preparation, renting drilling rigs – costs that have no salvage value after they are spent. 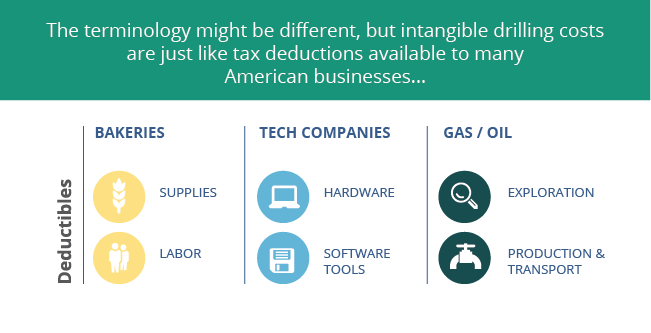 The standard IDC tax deduction – which has been around in one form or another for 100 years — allows producers to recover those investment costs quickly and reinvest them in exploring for, and hopefully producing, new American oil and natural gas supplies. Since 1913, IDCs have allowed producers to invest literally hundreds of billions of dollars in finding and delivering new energy that might not have been available without them. For America’s 7,000-plus independent oil and natural gas producers (who drill more than 90 percent of the nation’s wells), IDCs can be deducted in the year they are spent or spread over 60 months. Independent producers are in the business of exploring for and producing oil and natural gas. The integrated companies (who have marketing or retail operations like gasoline stations) must amortize 30 percent of IDCs over 60 months and can deduct the remaining 70 percent in the year they are spent or spread them over 60 months. Drilling a well does not guarantee resource production; the IDCs deduction enables America’s independent oil and gas producers to continue exploring even when a well is unsuccessful and reinvesting production revenues when they are. Independent producers reinvest as much as 150 percent of their US cash flow in new US projects. This investment and reinvestment in America’s vibrant oil and natural gas production sector supports the small businesses and the countless other industries and consumers who benefit from affordable, secure American energy. Do Other Industries Get IDCs? The terminology might be different, but IDCs are just like tax deductions available to many American industries – to farmers for fertilizer and to technology companies for research and development. Even bakeries have deductible costs. Their supplies—sugar, flour, eggs—are all tax deductible raw materials, along with labor costs. No matter the industry, these are all upfront costs facing nearly every American small business owner with no guaranteed return on investment. In fact, IDCs are no different than costs that are immediately deductible under the general tax law that applies to all business losses – vital deductions, not government handouts, that help American businesses. Why Are IDCs Important For America? IDCs were put in place to reflect the deduction of expenses specifically for oil and natural gas production – and that’s just what they do. Removing this 100-year-old tax provision from the code would not only strip away roughly 25 percent of the capital available for independent producers to continue looking for new oil and natural gas, but also diminish the many economic benefits created by those activities. 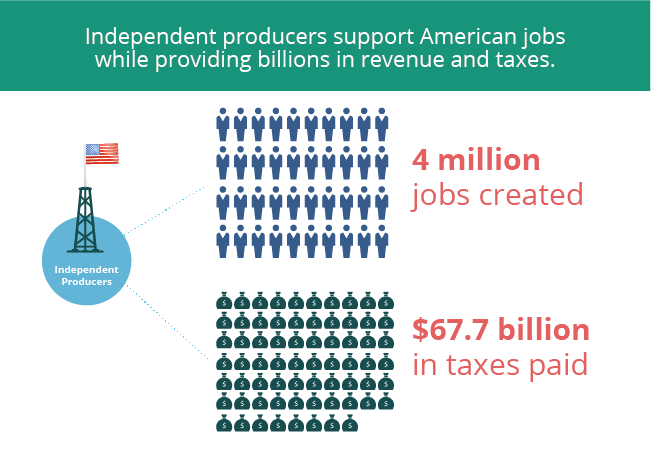 Independent producers support over 4 million direct, indirect, and induced jobs – in the lower 48 states alone – while providing billions in revenue and taxes. In 2010 alone, onshore upstream taxes amounted to $67.7 billion.